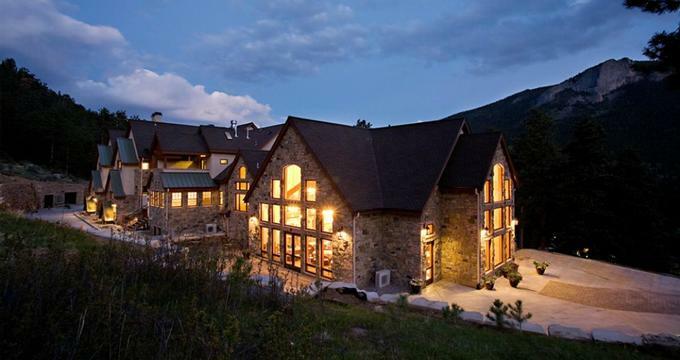 Nestled in the majestic Rocky Mountains above Estes Park at the Fall River entrance to the Colorado Rocky Mountain National Park, Della Terra Mountain Chateau is one of Colorado's most romantic and luxurious boutique inns. Surrounded by the beauty of the untamed wilds and lush forests of Colorado’s southern valley, this magnificent stone lodge is tucked amongst a verdant sea of pine trees and rugged granite cliffs and promises an unforgettable experience. The elegant Chateau boasts luxurious lodgings with stone floors, grand fireplaces, en-suite bathrooms, and private balconies with hot tubs, and essential conveniences such as HDTVs and wireless Internet access to ensure absolute comfort. A communal lodge lounge has a three-sided stone fireplace and waterfall, and luxury facilities include a private spa treatment room, sauna, styling salon and state-of-the-art theater room. Della Terra Mountain Chateau features 14 beautifully appointed luxury suites designed in warm, earthy hues and tones to celebrate the elements, skies or seasons. Suites feature stone floors, contemporary décor and modern furnishings, and deluxe conveniences such as woodburning or gas fireplaces, ample sitting areas and private balconies with hot tubs and breathtaking views. Suites offer bedrooms with designer king, queen or double beds with pillowtop mattresses, luxury linens and hypoallergenic pillows, and en-suite or private bathrooms with walk-thru jetted showers, oval soaking tubs, fresh towels, and bathrobes, and organic bath products. Cozy sitting areas or reading nooks offer plush sofas, overstuffed armchairs, and elegant, transparent fireplaces, and modern amenities include HDTVs with DVD/CD players, iPod and surround sound systems, hairdryers, irons and ironing boards, and complimentary wireless Internet. Della Terra Mountain Chateau also offers the cozy self-catering mountain cabins scattered on the mountainside below the chateau. Built in the early to mid-1900s, these charming log cabins feature spacious living areas with log-burning fireplaces and ample seating, fully equipped kitchens, comfortable bedrooms, private bathrooms, and covered patios with hot tubs. Modern amenities include HDTVs with DVD/CD players, hairdryers, irons and ironing boards, and complimentary wireless Internet. A deluxe continental breakfast is served every morning (only to guests staying in the main chateau) and includes freshly brewed coffee and tea, fresh fruit juices and fruit, cereals and homemade granola, yogurt, baked bread and other goods, eggs dishes and more. Estes Park is home to a wealth of restaurants and dining establishments that serve lunch and dinner. Della Terra Mountain Chateau offers an array of luxury amenities, including a full service spa called The Essence Place, where guests can enjoy pampering and indulgent massages, body treatments, and salon services. The Inn also has a dry heat sauna, and in-house, state-of-the-art theatre room where guests can watch movies in style. Surrounded by the majestic beauty of the Colorado Rocky Mountain National Park and its world-renowned mountains, Della Terra Mountain Chateau and the national parks and leisure areas offer a wide variety of activities for recreation, ranging from quiet riverside picnics to adrenaline-rushing white-water rafting adventures. Outdoor leisure and sports include hiking, climbing, mountain biking, kayaking, river rafting, fishing, horseback riding, off-road and ATV riding, hunting, and snow-based sports like skiing, and snowboarding. Quieter, more relaxed pursuits include scenic drives, mountain tours, birding, wildlife watching and exploring museums and art galleries. Della Terra Mountain Chateau offers a magnificent mountainous and wooded backdrop for romantic weddings, receptions, and ceremonies. Natural beauty and modern design merge to create a spectacular setting for all types of functions from small, intimate ceremonies to large, lavish dinners. The Chateau offers two exquisite locations for weddings, namely an indoor ceremony and reception area known as The Celebration Place, and an outdoor ceremony area called The Devotion Place. Boasting high, lofty ceilings, large arched windows and a full balcony with incredible mountain views, The Celebration Place can host both ceremonies and receptions of up to 200 guests. The venue features a raised platform, a dance floor and DJ area with sound and lighting systems, a live band area, full service bar, and gourmet kitchen for catering. An intimate indoor Gathering Place has two large fireplaces and covered balconies for appetizers and celebration toasts. Nestled among the pines on the mountainside with breathtaking vistas in all directions, The Devotion Place is an inspiring outdoor site with a raised alcove overlooking a terraced hillside.